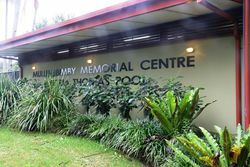 The Memorial Centre was originally erected in memory of those who served in World War Two. The Memorial Centre Pool has now been renamed after Olympic swimmer Petria Thomas who grew up in Mullumbimby. 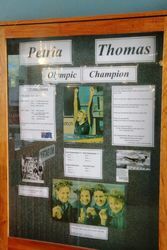 Petria Ann Thomas, OAM (born 25 August 1975) is an Australian swimmer and Olympic gold medallist and a winner of 15 national titles. She was born in Lismore, New South Wales, and grew up in the nearby town of Mullumbimby. Centre". Presenting the plans drawn up by Mr. Board to the meeting, Mr. Mercer informed those present that all the work and plans which had been prepared to date both by Mr. Board and Mr. Newton had been free. The secretary of the baths committee was directed to convey the public's thanks to Messrs. Board and Newton, and also the thanks of the meeting to the members who constituted the investigating committee set up to carry out the initial planning. Northern Star (Lismore, NSW), 17 February 1950.